As I've talked about before, I live in Maricopa, AZ, a town of around 35,000 south of Phoenix. We are surrounded by open desert, with Native American reservations on two or three sides (depending on how you look at it). Many towns in this part of Arizona have been excellent birding spots, acting as 'vagrant magnets' and oasis in the desert. Casa Grande, for example, has had interesting finds, such as Northern Jacana. Arizona City is another spot where birders occasionally make interesting discoveries. Arizona City and Casa Grande are right off of I-10, and have a track record among birders. If these similar sized towns can attract interesting birds, why not Maricopa? For this reason I was excited to participate in the 2011 Phoenix Area Aquatic Bird Survey, administered by Arizona Game and Fish. These sorts of thorough bird counts can result in interesting discoveries. My search didn't result in any rarities, but did turn up some slightly less-than-common species, including the Hooded Merganser below. 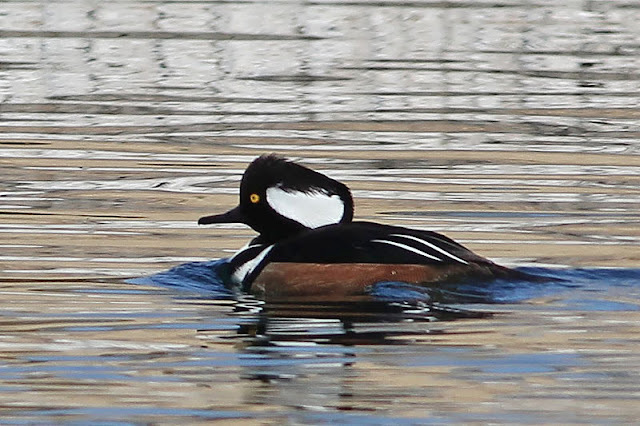 Hooded Merganser is a medium/large sized duck with an amazing white crest that it can raise and lower. In the photo above, the crest is pretty much lowered. While not rare, I was not expecting to see any Mergansers on my survey, so this was a nice addition. 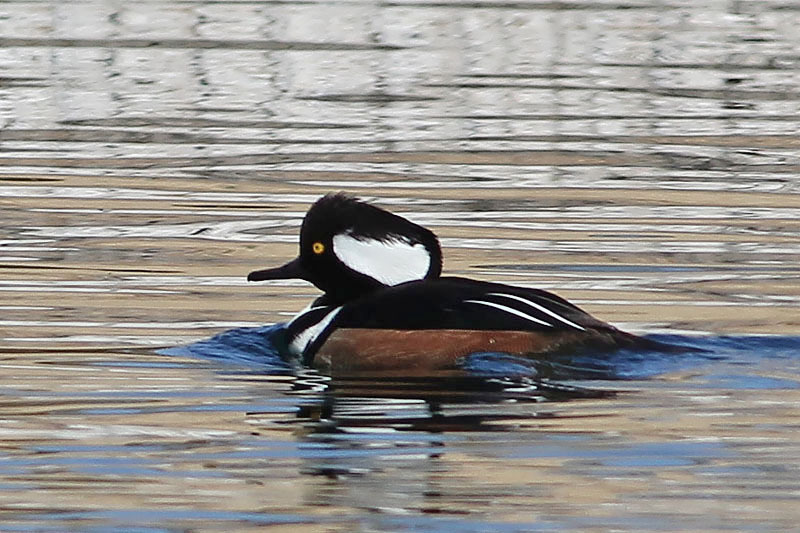 This Merganser was on a small neighborhood pond congregating with a few other Mergansers and a couple of Buffleheads. One nice side-effect of this bird survey was that I got to 're-learn' duck photography. It had been almost a year since I've been out photographing ducks, and I'd forgotten that even slow swimming ducks need a surprisingly fast shutter speed for sharp photos. Needless to say I ended up with way too many out-of-focus shots. I participated in that aquatic bird survey one year in AZ before I moved to Idaho and then to Utah. I gained permission from several golf courses (including free use of a cart) to count birds on their ponds. It was a lot of fun. Yes, these counts do have their side benefits. I got access to two courses in Maricopa - one of which had an abundance of birds!